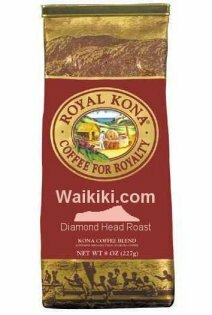 Waikiki.com features the finest Gourmet Coffee roasted in the Islands. Start the day with our Diamond Head Roast. Perfectly blended Kona Coffee, roasted to their peak flavor and aroma to be enjoyed by visitors. They make Great Gifts! Certified Hawaiian Kona. It is a full-bodied, completely balanced coffee. Medium dark roast. Superbly aromatic and smooth. Regular Whole Bean.